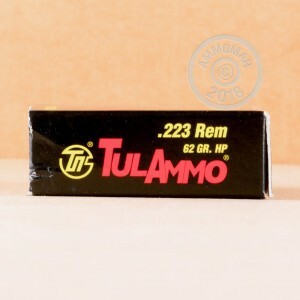 Tula ammunition is a great way to get you shooting out at the range without breaking the bank. These new 223 Remington rounds feature a bi-metal 62 grain hollow point projectile that will stick to a magnet. The casings in this 20 round box are cost effective berdan primed steel, and are not re-loadable. 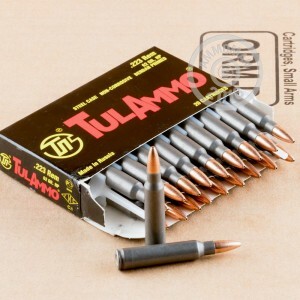 Tula has a reputation in the shooting industry for being affordable ammo that is good for target practice, especially if you do not reload your spent casings. The Tula Cartridge works has been producing ammunition since 1880. Located in Tula, Russia, this facility is capable of producing billions of steel cased rounds each year. They currently produce over 40 types of small arms ammunition for both military contract as well as the civilian market and export their products to over 20 countries. Do you need more than a couple boxes? At AmmoMan.com all order over $99 will receive Free Shipping! So stock up and save more!